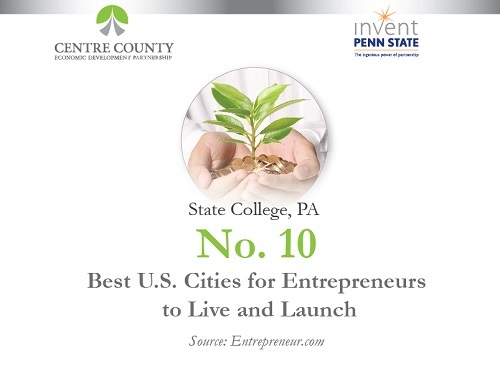 Centre County has a welcoming and nurturing entrepreneurial ecosystem, with a robust support network at all stages of the entrepreneurial and economic development continuum. With a long history of business incubation -- some of Centre County's most recognizable companies got their starts in CBICC incubators -- the Chamber's mission embraces a significantly broader entrepreneurial development emphasis. Under a historic Memorandum of Agreement signed with Penn State University in 2015, the CBICC partners with the university in supporting Invent Penn State initiatives. Through CBICC membership, entrepreneurs at the earliest stages of business development benefit from valuable connections with experienced, expert business, community, academic and government leaders. Happy Valley LaunchBox is a no-cost business accelerator program with co-working space for Happy Valley entrepreneurial teams with a scalable business concept. Learn more. Wherever you are on the entrepreneurial path, Invent Penn State has the resources and opportunities to collaborate, innovate, invest or grow a business. Learn more. SpringBoard is a coworking space located in Bellefonte, PA. Learn more. New Leaf Initiative is a coworking space, collaboration hub located in downtown State College. Learn more.